Casual but trendy, this 24-hour, open 7 days a week restaurant is the perfect choice for a casual breakfast, lunch or dinner. Hearty and great food for a reasonable price, as well as being open 24/7, this place is a safe and easy choice for any time of the day. I went for dinner with friends on a Friday night, and it was packed- you couldn’t find a place to stand to wait for a table. Luckily four pretty girls didn’t have to wait long, and we got seated in less than 5 minutes lol. Warm, cheese biscuits to brought to the table with our waters. Yum! 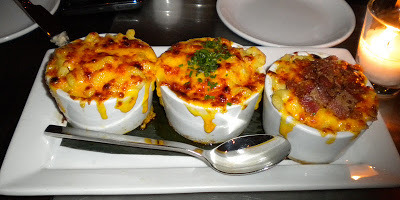 Delicious Mac N’ Cheese. Each sampler was so flavorful- perfectly cheesy and creamy. I loved the different flavors of each one. They were all amazing. I loved the truffle one and the gouda and bacon. They were all made perfectly. Highly recommended! It kind of tasted like tomato sauce lol. It had great flavor and it was thick and rich. It was overall a good soup. You can create your own Cafeteria burger. They give you a bunch of topping choices, this is what we decided to get on it. Good burger! LOVED the parmesean truffle fries too.